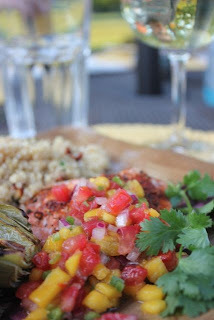 This is one of my go-to summer staples... grilled salmon and this delicious salsa. It is incredibly delicious and very healthy - so it won't hurt that bikini body you've worked so hard for this summer. The inspiration for the salsa came from one of the recipes in the P90X nutrition plan booklet. If you still need to work on that bikini body, P90X can help. I'll warn you it's intense and you'll be sore, but it feels great to get your body moving. 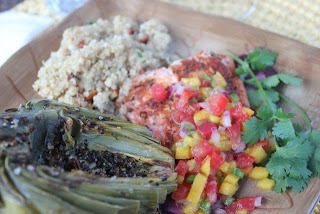 Or just stick to your current exercise routine and try this delicious dinner. In a medium bowl, combine all ingredients except the salmon. Salsa can be made a few hours in advance. Grill the salmon over medium-high heat for about 14 to 15 minutes, flipping half-way through cooking. 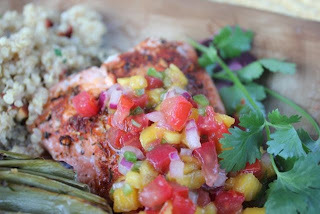 Top the grilled salmon with a large spoonful of the mango ginger salsa. Serve with quinoa and vegetables. Try quinoa with bacon and almonds.